Automatic cleaning scrubber can be used indoor and outdoor, it's great for bathroom,tub,floor,wall,car surface or car tire,bathtub etc. The electric spin scrubber is made up of three detachable parts, convenient for your easy installation and space-saving storage. The Super Power Scrubber is powered by a 10.8-volt rechargeable battery, allowing you to clean over a place without wasting traditional batteries,the spin scrubber can be used to work through soap scum, mildew, grime, Flexible bristles gets into cracks and crevices with supreme effectiveness! 1 *Cotton flannel pad: Used for flat bathroom, tub, tile, wall. 1 *Long bristle brush: Used for toilet bowl, car wheels, door gaps. 1 *Sponge brush: Mainly clean the window glass, car window, and mirror. 1 *Scouring pad: Used for the hardwood floor, Dressing tables or kitchen oil stain. 1*Hard Short Brush: Used for cleaning the hard tile floor, swimming pool, bathroom. ✪LONG-LASTING PERFORMANCE: The Cordless scrubber cleaner included Powerful 10.8V/2000mAh Samsung Li-ion battery is capable of holding a charge for an extended period of time - up to 90 mins long last working time after fully charged (2.5 hours fast charging) and powerful rotating speed. ✪IPX7 WATER RESISTANT: Lets you use this cordless scrubber in wet and dry areas, it also be safe to use in the water as we have hundreds of functional testing, it can continue to soak in the sink around 1 meter, and the host reaches waterproof level that is impervious to water. 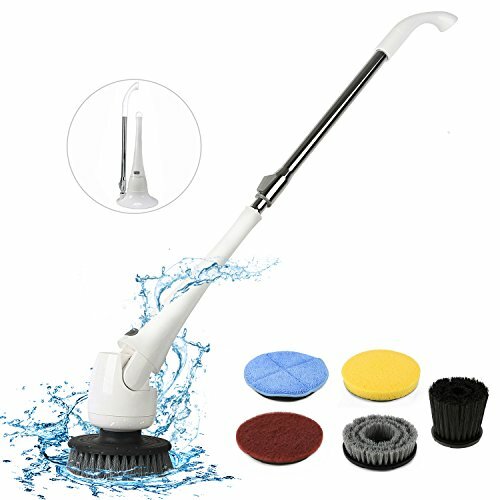 ✪TELESCOPE HANDLE and ADJUSTABLE ANGLE: This electric spin scrubber bathroom cleaner's luxury appearance and ergonomic handle with telescoping tube suitable for different body build people. 60° rotatable spin head to clean most places of the corner without bending . The longest is 49 inches and the shortest is 40.5 inches. ✪LOW NOISE WITH POWERFUL ENGINE: High-torque sordless spin scrubber enable you to scrub any dirt in your house. However, the volume within 70db for idling, but can be controlled within 65db when you do the cleaning. ✪MULTI-FUNCTIONAL - 3 Interchangeable brush and 2 pad heads to meet multiple cleaning needs. The replaceable brushes and pads can easily clean each corner of the room. it's suitable for cleaning the bathroom, balcony, laundry room, the uneven tile surface and other water-damaged places, and it's easy to dismantle and storage. If you have any questions about this product by Fortune Dragon, contact us by completing and submitting the form below. If you are looking for a specif part number, please include it with your message.